Rolling up to standing vertebra by vertebra is often taught as the kinder, gentler way to come up to tadasana (mountain pose) from a standing forward fold. But in truth, this transition may not actually be so kind and gentle. Rolling up incorrectly carries great risks, and rolling up correctly is challenging, especially for beginners who are often the target audience for this cue, and especially at the beginning of class when the roll-up is most often taught. In fact, it's for these reasons that many experienced teachers and practitioners are finding that the roll-up is uniquely worthy of reconsideration. Rolling up incorrectly carries great risks, and rolling up correctly is challenging, especially for beginners, who are often the target audience for this cue. 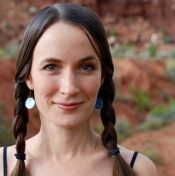 “Often, rolling up is a missed opportunity to strengthen and organize the core muscles closest to the bones,” says Jonina Turzi, a doctor of physical therapy specializing in kinematics, who is also a yoga teacher and the owner of West End Yoga in Lancaster, PA. “Rolling up incorrectly can also be compressive to the sacroiliac (SI) joints, the labrum of the hip, or the intervertebral discs. And it can increase the likelihood that when you are rounding down one day to pick up a pencil, you’ll throw your back out,” she explains. When sacrum is nutated, there is a slight but visible crease in the sacral region. When sacrum is counternutated, the sacral region appears flattened. In addition to the problems posed by passive sacral counternutation, “rolling up is often done with incomplete segmentation of the spine,” says Turzi, meaning that because of gaps in awareness or strength, many of us roll up in large increments instead of vertebra by vertebra, which can cause shear force damage to the intervertebral discs. Imprecise segmentation of the spine can also stand in the way of rehabilitation: Turzi sees many PT clients who have been undulating in transitions in their yoga practice for years, inadvertently avoiding the muscle repatterning required to heal SI joint or hamstring tendon problems. Many of us roll up in large increments instead of vertebra by vertebra, which can cause shear force damage to the intervertebral discs. Truly rolling up vertebra by vertebra requires the engagement of many postural or “core” muscles, the deep muscles closest to the bones. To find out if you are effectively using your core muscles to roll up, you might enlist the help of a physical therapist or attentive yoga teacher. As you roll up, have that person rest a couple fingers lightly on your lowest lumbar vertebra. Can you lift into her fingers? How about the next vertebra? And the next? It is up to her to discern whether or not you are lifting the designated vertebra. If she encounters what Turzi calls a “shadow spot,” or weak area, you might not be able to tell for yourself. Pause in those spots for a few breaths or a few minutes, revisiting them repeatedly if necessary, until they wake up. You will notice that there is nothing passive about rolling up this way; you will have to use your legs to create the movement, pressing down strongly into both feet in order to lift into the fingers on your back. Fortunately, until we have earned our roll-up, there is a universally helpful way to come up to stand: keeping our spines long while we hinge at the hips. When not using a dowel, to increase the likelihood that the back of your head and tailbone remain aligned as you rise, try coming up with your upper arms close to your ears while you hold a yoga block between your hands or grab opposite elbows overhead. Step 1: In your fold, press your shins forward so you can root down through the balls of your feet, setting the stage for your legs to take full ownership of the length of your spine. Step 3: Keeping the back of your head and tip of your tailbone against the dowel, come all the way up to standing. Notice how it feels to rise when you are already tall inside. When you move from tadasana into a forward fold, reverse the process. From a vertical spine, root with the fronts of your feet, move your pubic bone back (again bending your knees if need be), and begin to tip your pelvis forward so that you stay on the dowel as you lower instead of rounding your way down. Once your spine has lowered past a 90-degree angle with your thighbones, you may move off the dowel. Parshvottanasana (pyramid pose) offers another chance to practice hip-hinging while maintaining healthy spinal length. While still upright in your pre-pyramid stance, align your head and tail along a dowel. If your right foot is forward, take your left arm up, upper arm alongside your ear. Keep your upper arm next to your ear as you fold and lift. Start by just lowering a few inches, and then come back up. Repeat, slowly increasing the arc of your motion. See if you can bring your spine parallel with the earth while still keeping your head and tailbone on the dowel. 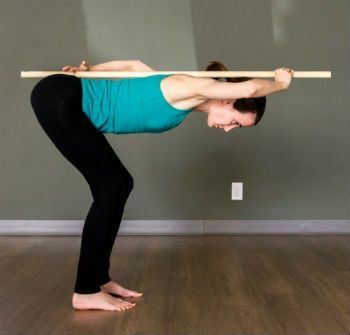 If at any point in the process of hinging up or down you notice you're starting to move off the dowel (e.g., your sacrum is tempted to slouch back or your head to sag), you have a valuable opportunity to strengthen where you most need it. Turzi suggests that you dwell in that place of sustainable challenge for two to three minutes, holding and breathing, in order to create a new pattern in which you ground through your legs instead of gripping in your trunk or compressing your spine. And that enlightenment is portable. After a class that encourages us to lengthen rather than cave in, we will be primed to maintain optimal height in the spine in our day-to-day activities, so that every time we bow to pick something up from the floor, we retain our inner expansiveness, and every time we rise, we lay claim to the height that is ours, inching ever-nearer to our highest possible selves. And until we earn the roll-up, there is an undulatory movement that remains always available to us: that of the breath, kindly and gently rolling up and rolling down inside our enlightening bodies.